The very best way to keep water pure and fresh is to bottle your own in glass container. Better taste, better quality; a great way to entice yourself to drink more water! 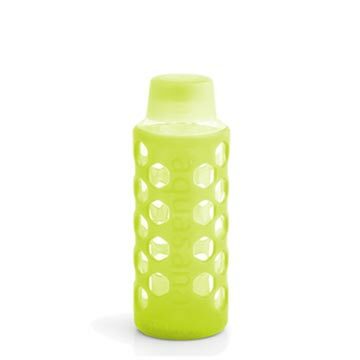 Bottle with Silicone Sleeve & Cap - Green is rated 4.6 out of 5 by 32. 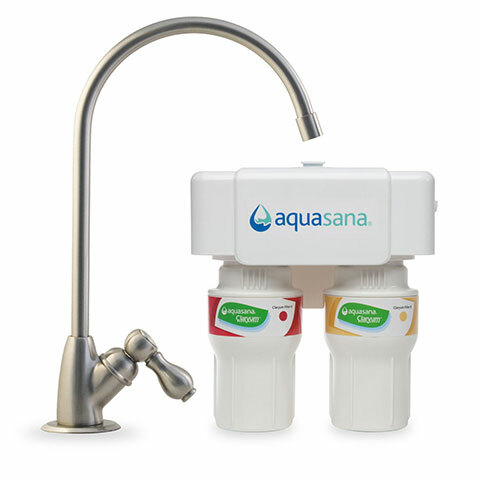 Filter at home, bottle your own and take it to go with the reusable Aquasana glass bottle plus protective silicone sleeve. 18 oz. glass bottles are the perfect size at home or on the go. Lead-free, cadmium-free glass with BPA free cap and silicone sleeve - no plastic or metal chemicals leaching into your water. Our colorful silicone sleeves protect your 18 oz. glass bottles so you can easily take them with you wherever you go. Honeycomb design provides a nonslip grip by reducing condensation slippage. Silicone sleeves come in six different colors to choose from with matching BPA-free plastic caps. The importance of drinking more water. Rated 5 out of 5 by R. J. from Aquasana Bottles with Silicone Sleexes These bottles which I brought a month ago have been great, I had the first ones without the sleeves but broke one and when I saw these with the sleeves I had to have, I love the non-slip silicone which make it easy to handle and it has a different feel, a feel of holding a bottle that feels snug and secure. Rated 5 out of 5 by Alice from nice bottle It is a perfect size. I like the protection the sleeve provides. It keeps the bottle from rattling in my cooler. If the bottle breaks, I have several more water bottles from Aquasana that will fit in the sleeve. Rated 5 out of 5 by water consumer from glass water bottle w- silicone sleeve Solid glass bottle. Great for daily use. The silicone sleeve that came with it is great in preventing chips on the glass from impact. Rated 5 out of 5 by water consumer from glass water bottle w/ silicone sleeve Solid glass bottle. Great for daily use. The silicone sleeve that came with it is great in preventing chips on the glass from impact. Rated 5 out of 5 by healer from Love the bottle and sleeve. would get more.. I bought for myself and will buy another as a gift for a friend. It's the greatest. Rated 5 out of 5 by Kay from Glass You can't leave plastic bottles in the car and drink from them so I got glass. I love them. Even if the water is not cold it tastes good. Rated 5 out of 5 by Stefanie from Recommend Take to work everyday and fill throughput the day. Is the cap for the 18 oz. water bottle with the silicone sleeve stainless steel or plastic? The cap is made of BPA free plastic - recommended to be handwashed. You can put your bottle and the silicone sleeve in the dishwasher! Please let us know if you have any additional questions. is the single glass bottle with silicone sleeve dishwasher safe? Can I purchase just a replacement lid? Just got this bottle in the mail. What's the best way to wash the bottle and to keep the cover from getting grimy? Can the sleeve and cap be sterilized? Parts of what I imagine is also silicone inside the cap have developed black dots and streaks of what appears to be mold. It can't be wiped off. How can these moldy looking stains be cleaned?